Democratic presidential hopeful Illinois Sen. Barack Obama waited yesterday afternoon for the doors to close in the elevator that would take him up to visit his grandmother in a Punahou-area apartment. After delivering a campaign speech, Sen. Barack Obama's first stop on his Hawaii vacation was a visit to his grandmother's Makiki apartment, where he also lived during his youth. Obama -- escorted by Secret Service and accompanied by a few campaign staff and a pool of reporters and camera crews -- arrived at about 4:10 p.m. yesterday and spent an hour with his 85-year-old maternal grandmother, Madelyn Dunham, who helped raise him. He was not accompanied by his wife, Michelle, and two daughters. 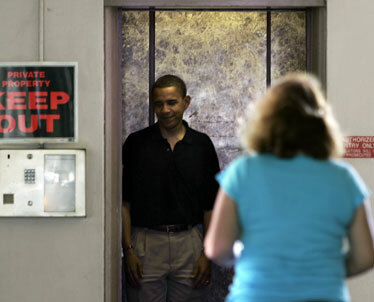 Obama waved to a few residents and reporters as he got into the elevator at the Punahou-area apartment building. One woman who lives in the building had two books authored by Obama in hand and watched as the elevator doors closed. She waited patiently outside the elevator. "I just hope I can still get an autograph," said the woman, who did not want to give her name. Another resident and her two sons awaited the presumptive Democratic presidential nominee with two red and green leis, then later went up in the elevator. "They probably let her go up and give the leis," the woman with the books said. "She's giving something. I want something." But a man identified as the building owner said the Secret Service did not allow her to present Obama with the leis. The woman with the books did not get Obama's autograph, either. Dunham, a retired Bank of Hawaii vice president, still lives in the same apartment where she and her husband helped raise Obama, who attended nearby Punahou School. Obama's half sister, Maya Soetoro-Ng, is his only other living relative left in Hawaii. Obama's arrival at his grandmother's apartment was kept fairly low key with a few Secret Service and two blue-and-white police cars escorting him. But a police helicopter circled the area prior to the Illinois senator's arrival. A Secret Service agent, who arrived in advance, tried to shoo away local media, saying he was not making a stop there.